Here was one of the sights they had set up outside to entertain. 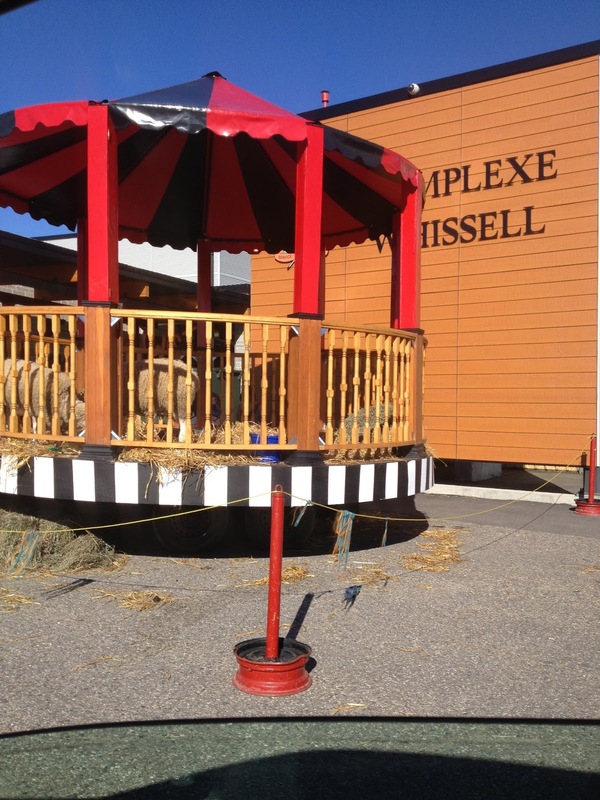 A sheep merry-go-round! I'm not sure how merry the sheep were to be inside that pen, slowing spinning with a guy playing an accordion in the center on a stool, but it was quite the sight. A shot of my desk spot. By the end of the class, these sheets were covered in splotches of blue! 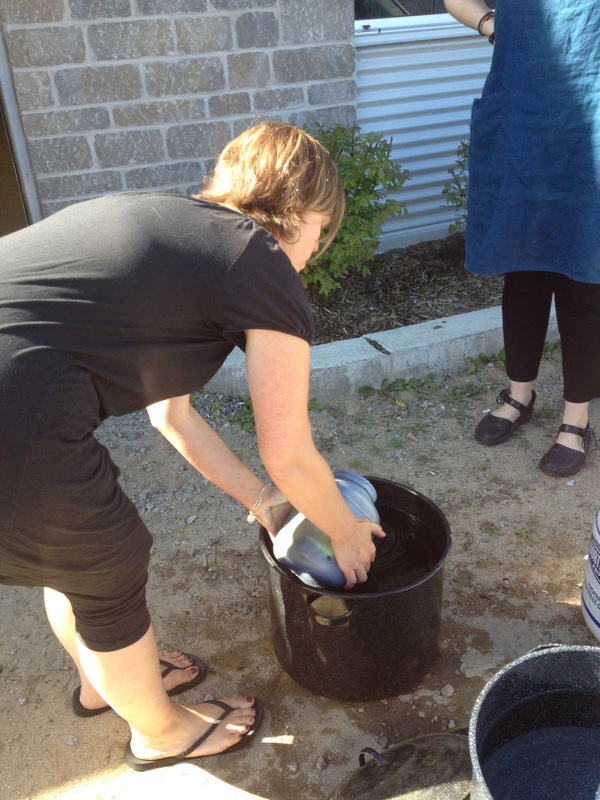 We all had a small canning jar so we could make a bit of an indigo dye vat to take home. Haven't cracked into mine yet, but let me tell you, it is very pretty. This was Jackie's work space at the front of the class. She told us she had spent at least three months learning all she could about indigo for her job at Swan's Island Company. 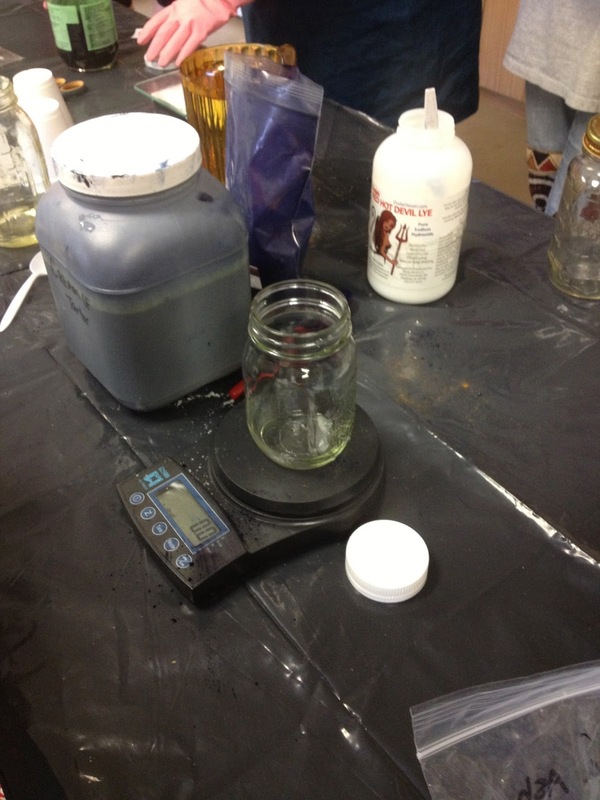 Testing and retesting to get the perfect percentage formula for the indigo extract that they buy. (What a fabulous job!) She shared with us the percentage that works best, and made a "master vat" in the large plastic container for us to use in the workshop. 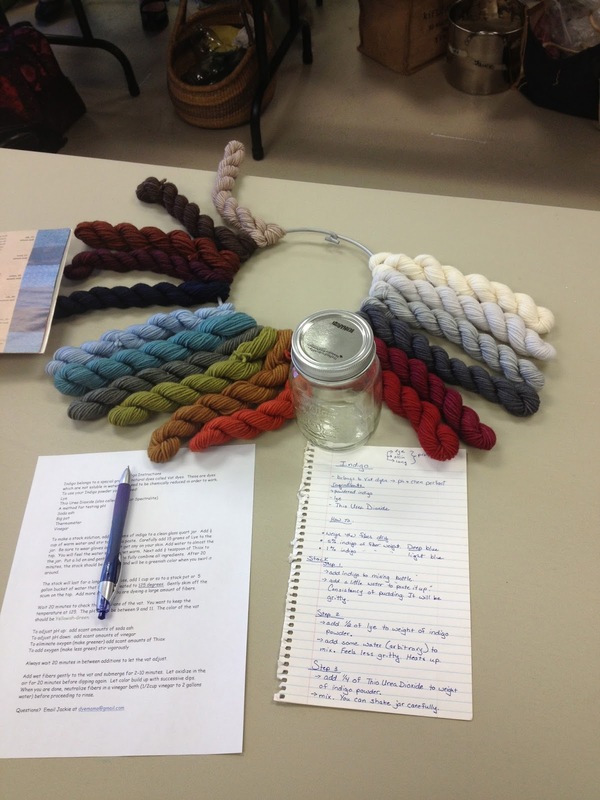 Here is more of the beautiful merino wool that Swan's Island donated to us for the Indigo workshop. We had to soak it first in water, even though Jackie had soaked them earlier. It was so warm, they were getting dry spots on them. The stainless steel rings the hanks are on are called "funny eyes." They are what lobster fishermen use when weaving their lobster traps. 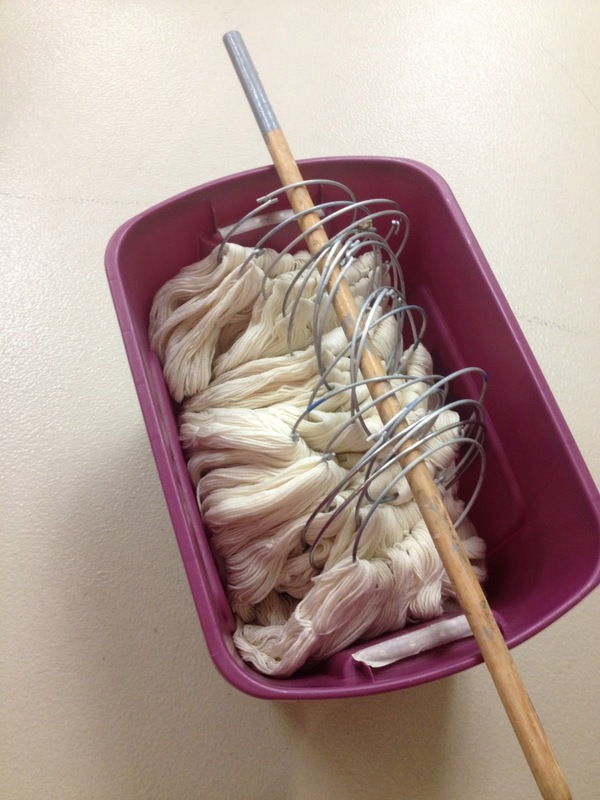 Excellent dyeing tools, these funny eyes! 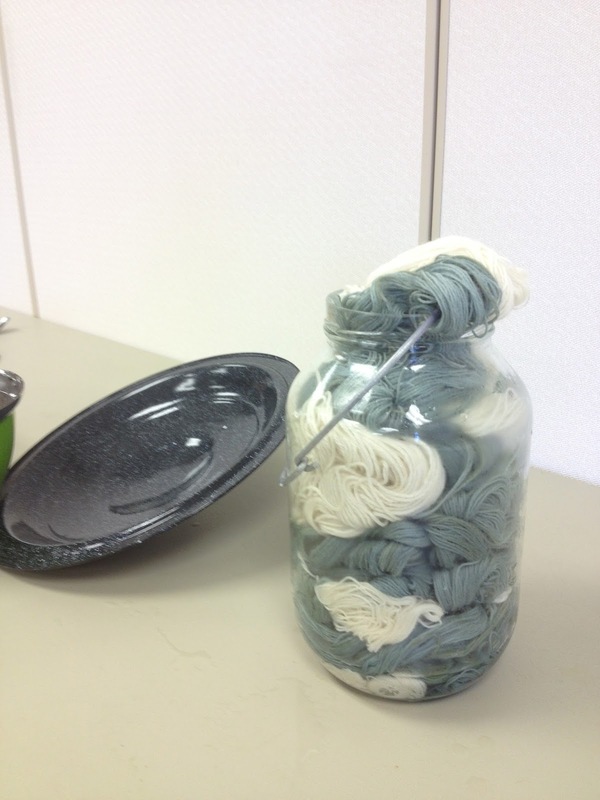 We were encouraged to bring in some wool or fabric that we wanted to dye with indigo. This is my extra large pickle jar, holding about 2000 yards of my sock wool I soaked. As you can see, most of it was pre-dyed. I had attempted to dye with black beans in February 2013, but my results were very icky in colour. I was hoping that the indigo would salvage these skeins. 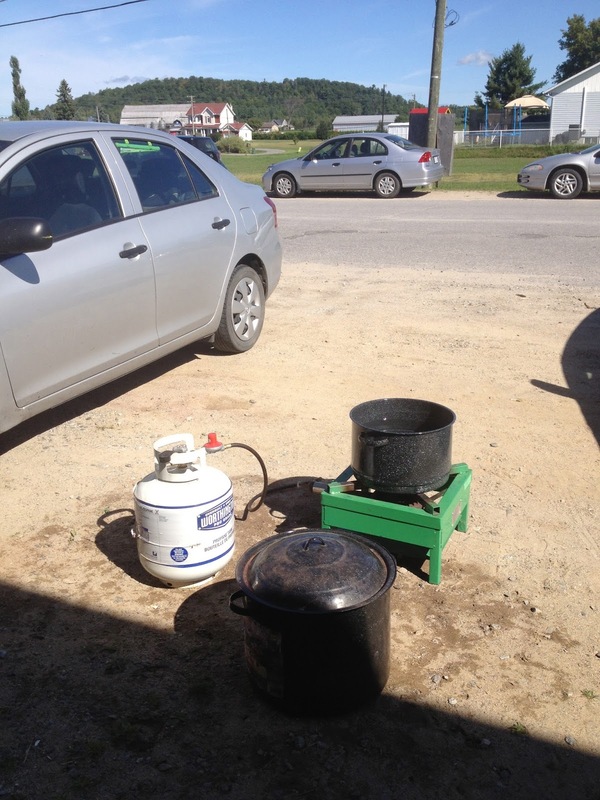 Again, our trusty propane burner! Indigo dye vats are tempermental ph and heat wise. Since there was so many of us in the class, and so many of us brought a lot of our own stuff to dye, we had to have two vats going at once. Sadly, only one burner. We made do by shuffling pots from the burner and constantly checking the temperature. I had brought my enamel pot and my little electric burner I got from a second hand store, but the burner would only heat a pot to a max temperature of 155 degrees F. Grrrrr! 180 degrees F is the magic number for most natural dyes. Good thing I did bring my pot. That's it on the burner in the photo. It turned into the second production vat for this class! Ah, the temptation of turning something blue. We workshop students went a little overboard. LOL! After a while, and a ton of items going through the vat, Jackie would "revive" the vat with a top up from the master vat solution she made in the classroom. Ph was taken again, colour of water was checked, and onto the burner it went to get it up to temperature to activate it. Jackie could tell by the green shade of the vat if there was enough of a "glug" from the master solution to produce the optimal shade of indigo blue. They don't call this woman a master dyer for nothing! It was like watching magic. In fact, the whole process of dyeing with indigo is like magic. Watching the skeins go from a green to a rich blue when you pull them out of the vat was... incredible! If you ever get a chance to do an indigo workshop with Jackie, do it! "From cold to hot, worry not, but from hot to cold, cannot be sold!" It is a balancing act, but when done right, indigo vat dyeing is so worth it!